On many campuses, the majority of students are nontraditional students. What does that mean? Who are they? 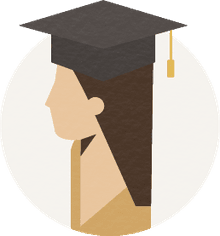 Nontraditional students are 25 and older and have returned to school to earn a degree, an advanced degree, a professional certificate, or a GED. Many are lifelong learners who know that keeping their brains engaged keeps them young and vibrant longer. Experts have suggested that continuing to learn can even help prevent Alzheimer's disease. Besides, learning is just plain fun when you are willing to dabble a bit. Consider taking a workshop on a regular basis. Nontraditional students are not your 18-year-old high-school graduates heading off to college. We're talking about adults who decide to go back to school after the traditional college age of 18-24. We're even talking about Baby Boomers. They are some of the most avid nontraditional students, and they are now in their 50s, 60s, and 70s! Examples: Baby boomers, people born in the years between 1946 and 1964, are flocking back to school to finish degrees or earn new ones. These nontraditional students now have the life experience and financial stability to make college more meaningful. Going back to school as a nontraditional student can be more challenging than it is for younger students for many reasons, but primarily because they have established lives that require balancing one more responsibility. Many have families, careers, and hobbies. Throw in a dog or two, maybe a Little League game, and the addition of college classes and required study time can be tremendously stressful. For this reason, many nontraditional students choose online programs, which allows them to juggle work, life, and school. How to Ace Your Grad School Interview After Taking Time Off - College applications are written primarily for 18-year-olds. When you older than that, sometimes by decades, the questions can seem silly. Or maybe you have a gap in your resume that needs explaining. These tips are for you. Ways to Stay Relevant Before Earning Your Master's Degree - When you need to take some time off from school, it's important to maintain your readiness to return. It's not all that hard with a little attention. Tips to Help You Rock Your Online Courses - More and more people are going back to school online. Something that was once frowned upon, is now safe, credible, and super convenient. Attend class anywhere you can take a laptop or other device. That's just about everywhere. Time Management Tips for Adult Students - Managing your time well is crucial for nontraditional students. We've got tips for you. Places to Get a Scholarship - Scholarships abound. You just have to know where to look for them. Don't be afraid to apply. Many scholarships are awarded by default to the few people who bothered to submit an application. Be one of them. Help with Writing - Brush up on your writing skills to avoid embarrassment. Help with Math - Math is a major reason people procrastinate about going back to school. Help is out there. Facts About Financial Aid - Money for college is available to almost everyone. Find out how to apply for financial help. That's just a sampling. We have lots of tips for you. Browse around and be inspired. Before you know it, you'll be back in the classroom, whether it's in a traditional brick building, on the Internet, or at a local community ed. workshop. Dabble!